Welcome! I'm an entrepreneur and startup mentor, and I was proudly nicknamed "The Roadshow" by my sales team. Most recently I co-founded SocMetrics, where we develop AI-powered tools for SMBs to build their Instagram followers in a targeted way. Prior to that I co-founded Going, acquired by AOL. You can follow me on Twitter @royrod, see my About Me or LinkedIn, or email me. In 1997 I had just finished my undergrad and was planning to go to a PhD program. Due to timing (Georgia Tech was on the quarter system, which I loved, but since changed to semesters) I had a gap and ended up doing a follow-on master’s at Georgia Tech, but decided to start seeing what my life might be like with the PhD by doing a summer at Xerox PARC, my dream research job. A number of us from Tech where there that summer: Josh Marinacci (now an O’Reilly Java author and Sun evangelist, moving on to Palm), Jason Ellis (who did continue down the PhD and research path and is now doing very interesting work at IBM Research on leveraging mobile technology in Africa), Rob Orr and others. And who can forget the inspirational tale of “Mike Netscape and Nicole HP”? Back the my total savings was probably $500, so finding an apartment and transportation were a pretty big ordeal. For housing, Josh’s aunt and uncle in San Jose generously put us up (well, I guess they would do it for him, but generously let me stay as well 🙂 ) for our first month while we looked for a place, which we eventually found in Mountain View. 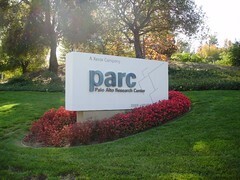 Renting a car for 3 months was exhorbitant, so I ended up buying a bike for $200 and biking a few miles from Mountain View to Palo Alto, which ended with a killer hill –Hillview Ave. to Coyote Hill Road– to the PARC campus. Sometimes the hill was just too steep and I would go up a third of the way and then into the Fuji labs and walk the rest of the way up. The place we landed at in Mountain View was Village Lake Apartments, 777 West Middlefield Rd. As Rhonda Dean said in White Men Can’t Jump, “We live in Vista View but ain’t no vista and ain’t no view.” But it was a nice, quiet place for the summer. It was a sweltering hot summer, and to make it through I would walk to the Fairway nearby and get a freezing-cold ice cream pop. You know those ice-cold-beer commercials where people are stuck to the couch and all of a sudden a magic cold front sweeps through and they’re free and refreshed? Yeah it was like that. Only with a chocolate-covered vanilla popsicle instead of brewski (I was still a teetotaler at that point 🙂 ). The part that tickles my memory now is that we were a mile from the Googleplex- except Google didn’t exist yet, they would incorporate later that year. However the G-boyz had already come out to PARC to give a talk about Pagerank. I remember thinking “yes, this definitely makes sense to me, and the recursive authority approach seems better than the current purely textual search engines.” Back then I had no idea the level of influence across the Valley and the world would follow. Many other memories from that summer -of course working with Keith Edwards; the amazing feeling of history at PARC’s Computer Science Lab with Mark Weiser’s presence permeating as an aura of inspiration throughout the place; the site visits to Sun, IBM Almaden (where I first met the inimitable and unforgettable Ted Selker); and most of all the amazing night sky near Yosemite with a density and brightness of stars like I had never seen before or since. I’ve been an entrepreneur, in one capacity or another, for over 15 years. I’ve been fortunate to develop a network of fellow entrepreneurs (David Cancel, Nabeel Hyatt, Andy Payne …), co-founders (Rebecca Xiong, Geoff Menegay), board members (George Bell, Bob Davis, John Pleasants …), advisors (Coach Wei, Eric Silberstein …), team members (Brian Morgan, Dr. Raymond Lau, Evan Schumacher …) among myriad others that has helped me learn, question and grow. I have advised dozens of fellow entrepreneurs starting out, and have always found it very rewarding (and, I’m told, usually helpful to them as well). Now that AOL has acquired Going and I’ve had some time to reflect, I’m very excited to begin sharing some of what I’ve learned -face plants, sweet successes, the whole gamut- with a broader community. how2startup – Entrepreneurial Learnings is just getting going but I hope to make it a real resource and community for entrepreneurs, collecting a lot of knowledge and tools that are dispersed by the sharp bloggers out there and doing what I can to further innovation, creativity and more people taking the bold leap that is, as David Cancel puts it, “making something from nothing.” Please join me there. Hi there, welcome to my site. Although most of my blogging and social media activity is taking place elsewhere, I may occasionally post more personal commentary here. For now the only content is the About Me page which probably borders on the ludicrously long, but hopefully has enough entertaining nuggets to justify itself. Why is this blog called The Roadshow? I have had many nicknames over the years, especially ones around the alliteration in my name. My favorite without doubt, though, was The Roadshow. I believe it was Paul Souza, now at Google, who came up with it while we were colleagues at iPhrase. Roadshows have a few meanings, from finance meetings for a new offering, to PR tours, but in this case it referred to all the sales calls we were doing. Paul was the bag-carrying sales guy and I was the product manager, out evangelizing, getting real-world feedback, and -oh yes- selling with the credibility that not being officially in sales affords. We made a good team. Since those days I could never wait to get in front of real people -users, clients, investors, doesn’t matter who as long as they aren’t on the payroll or otherwise at risk of groupthink- to learn from, evangelize, and interact with them. I was born in Argentina and have lived in Brazil, Mexico and Germany, and in the US since 1992. I used to be a hacker, but was always interested in the humanities as well. Probably that is what took me to grad school at the MIT Media Lab, to do research in social media before the term was common as part of the Sociable Media Group. After grad school I worked in engineering, usability, product management, marketing and then general management. I’ve been involved with startups one way or another most of my life, and most recently co-founded Going -a user generated local events company for people looking for cool things to do in major cities, as well as for venue owners, event promoters and ticket sellers- which AOL acquired in June 2009. Startups are still my passion, as I work toward my longer-term interests in furthering education, international cooperation and other goals.